With the annoucement of support for h.264 and AAC in the flash player i feel a bit challenged to add support for this in RichFLV too. AIR that analyses MP4 files and traces out all the atoms it finds with path, position, size and container info. The best ressource i found till now is the quicktime description from apple. 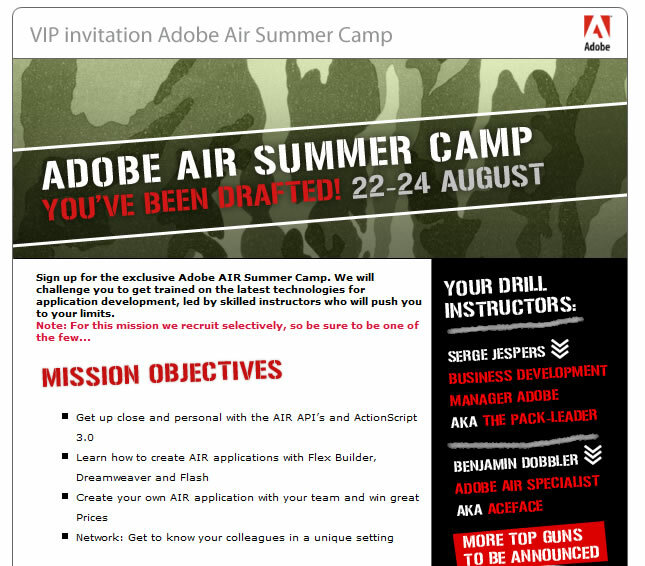 I´m back from the Adobe AIR Camp in Dinant (Belgium). It was a really cool event with extremely interested and motivated people. It was nice to see how quick people were able to build applications even if they had never used AIR before. Cudos to Serge Jespers from Adobe Beneluxe (The Mike Chambers of Europe ;-)) for putting so much effort into organizing a perfect event – and for inviting me. If you`re interested you can get the source files of my talk here and the PDF here. I`ve uploaded some photos to flickr. See them here.